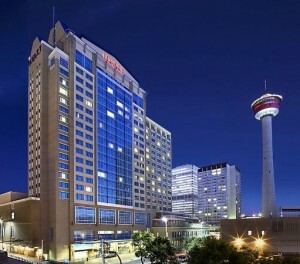 Experience Urban Sophistication in Downtown Calgary. Located on more than seven acres of prime waterfront in a parkland setting, this superb accommodation includes 260 newly renovated guestrooms in two towers, 60 suites and condominiums, as well as 70 luxury waterfront villas in the Royal Private Residence Club. Nestled on the crystal waters of Okanagan Lake in the heart of the cultural district, Delta Hotels by Marriott Grand Okanagan Resort is a destination all its own with exclusive amenities such as Club Floor Lounge, full-service Spa and Fitness Centre, Restaurant & Wine Bar, Coffee Bar and seasonal poolside Cabana Bar. OAK + CRU Social Kitchen & Wine Bar (opened June 2016) is a vibrant, social hub located on the water with a fantastic outdoor patio. Created and inspired by the Okanagan Valley, the regional menu is anchored by the fire deck oven. It features skillfully crafted cocktails and the largest exclusively Okanagan wine list.